Deliver hundreds of thousands of text messages using our mass text messaging platform. Our system allows your business to deliver promotional messages, alerts and other information via SMS to your subscribers, existing customers, prospects or any other marketing list. Send mass text messages to generate leads from qualified prospects or contact your existing customers to encourage repeat business. 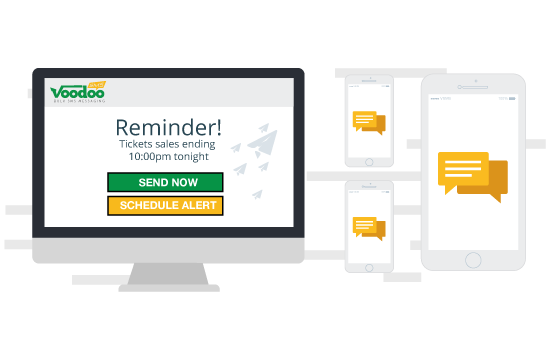 Voodoo SMS allows you to send scheduled texts to your target list, to send messages in small batches or to send an immediate broadcast. Our volume pricing lets you save money the more you send, with text messages priced from just 1.74p each for high-volume users. Our cost-effective platform is designed to help you reach your marketing targets and achieve profitable, measurable results. Why should your business use mass text messaging? If your business wants to keep in touch with its existing customers or reach out to a brand new audience, mass SMS marketing is the channel to choose. According to Ofcom, more than 93% of UK adults own and regularly use a mobile phone, giving SMS campaigns a serious reach. Better yet, people are far more likely to read SMS text messages than emails. While many email messages go unnoticed or get deleted before they're read by their recipients, mass text lets you put your message directly in front of a responsive audience. With our bulk pricing as low as 1.74p per message, mass SMS is also much more affordable than direct mail. For the same cost as a direct mail campaign targeted to just a few thousand people, you can reach an audience of hundreds of thousands using targeted mass text messages. How does our mass text messaging service work? Our mass text platform is designed to be easy to use, while offering your business incredible power to reach new prospects and existing customers through SMS. Even if you don't think you're a “technical” person, you can quickly set up and launch your SMS campaign. Creating your free Voodoo SMS account and launching your campaign is simple. Fund your campaign by selecting your desired number of credits. Our volume pricing means you'll save money on each message when you send en masse, with pricing from just 1.74p per SMS. Upload or create your contact list and prepare your SMS message. Using our platform, you can choose to deliver your message immediately or schedule it to for a specific time and date. You can even deliver your messages in batches, allowing you to track your campaign's results live. Our user friendly platform lets you quickly and easily create dynamic SMS messages that use custom data fields to display a user's name or other information. Dynamic texts are a great way to improve your response rate and generate a higher return on investment from your campaign. Easily integrate Voodoo SMS with your app through our mass text messaging API. With our API, you can easily deliver SMS notifications and contextual information to your users and customers for account verification and other purposes. Thanks to our volume-based pricing, you'll spend less on each text message when you deliver SMS en masse. Get pricing as low as 1.74p per message when you fund your account through our easy to use mass text platform. Ready to start your mass text messaging campaign? With its fantastic read rate and low delivery costs, mass text message marketing is one of the most cost effective and profitable marketing channels for your business. Create your account and start connecting with your prospects and existing customers through SMS now.